Housing added 0.7 percentage points to real GDP growth in the first quarter of 2014, however the construction component (residential fixed investment) detracted from growth over the past two quarters owing to the poor weather conditions seen across the country over the period. 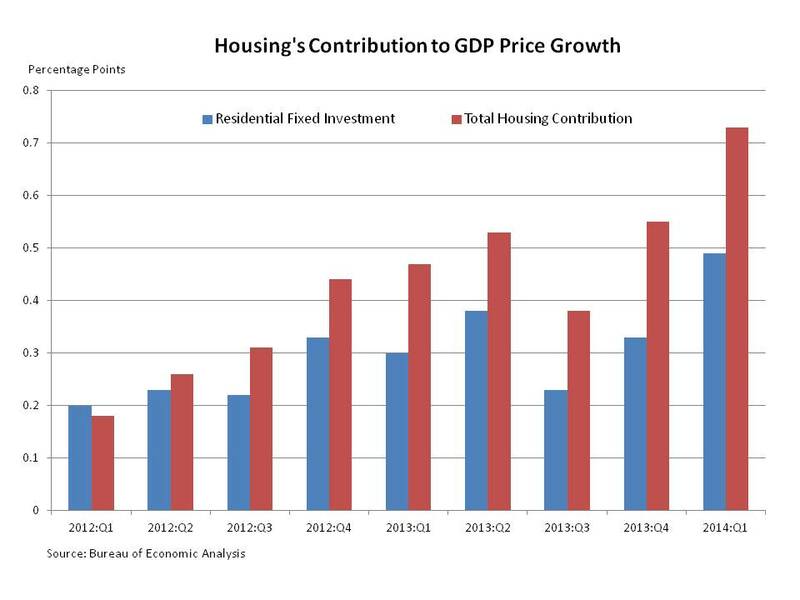 In addition, housing accounted for 15.6 percent of total real GDP, which is low from a historical perspective. The price component of GDP is becoming more interesting, however. 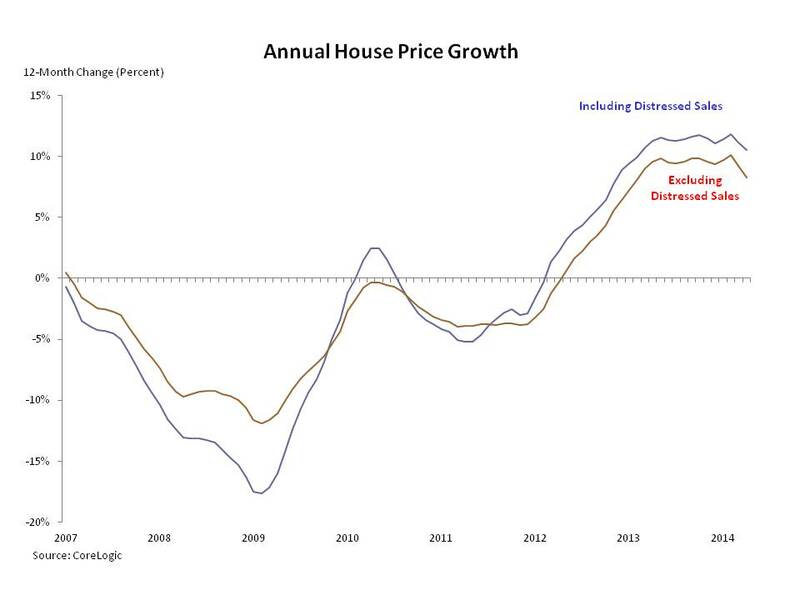 Starting in 2012, housing has been contributing more to prices, for the most part, as seen in the figure below. In the first quarter of this year, it added over 0.7 percentage points to growth in the GDP price index, led by nearly 0.5 percentage points in the construction component (the most since the third quarter of 2008); the overall price index rose 1.3 percent. This is partly due to increased construction costs and higher rental prices. Currently, overall inflation remains subdued and is within the Federal Reserve’s comfort zone. But moving forward, if housing becomes an even larger share of GDP, it would likely place upward pressure on inflation measures in general. House prices grew by 10.8% between April 2013 and 2014, according to the S&P/Case-Shiller 20-City Composite Home Price Index, which was less than the 12-month growth rate of 12.4% seen in March. Similarly, the Federal Housing Finance Agency’s Purchase-Only Index rose 6.0% compared to 6.4% in March. On a seasonally-adjusted monthly basis the 20-City Composite index increased by 0.2%, while the Purchase-Only index was virtually unchanged. Both indices show that annual house appreciation has slowed over the past five consecutive months ending in April and suggest the housing market may be returning to its long-run trend of growth. Among the 20 metro areas, Las Vegas experienced the largest annual gains (18.8%), followed by San Francisco (18.2%) and San Diego (15.3%). Meanwhile, cities experiencing the smallest increases include Cleveland (2.7%), Charlotte (4.4%) and New York City (5.4%). 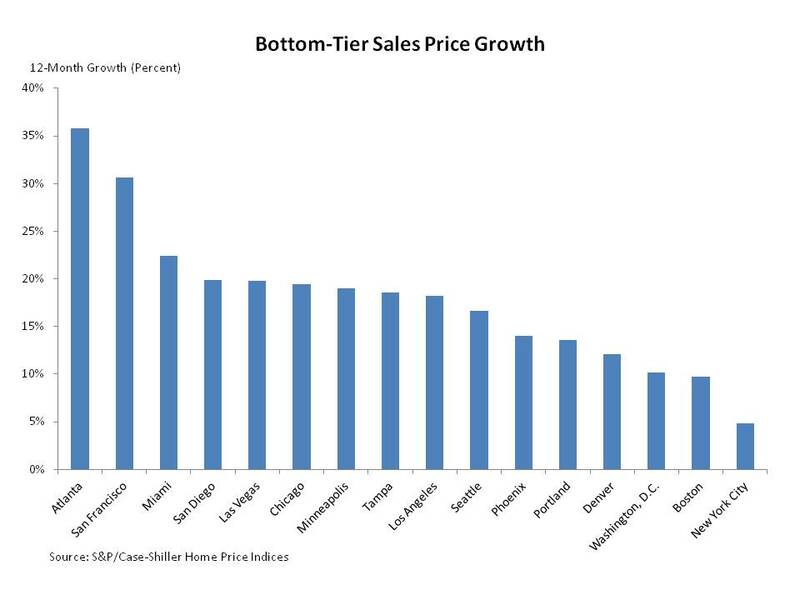 In addition, some areas are exhibiting large price gains for lower-priced homes as the chart below demonstrates. In April, Atlanta saw a 35.8% annual increase in homes under $153,000 and San Francisco saw homes under $496,200 rise 30.6%. In contrast, New York City saw an increase of 4.8% and Boston a 9.7% gain. The growth rates may be inflated, however, due to previously distressed homes being resold. For instance, CoreLogic provides a comparable house price index to the S&P/Case Shiller series and also has an additional one that excludes distressed homes. Foreclosed properties generally sell for a discount, currently at around 18 percent in April, according the National Association of Realtors, which suggests they would weigh down the overall market index. Yet since 2012, it appears distressed sales have added to the market’s growth, as seen the figure below. What’s occurring is during the housing crisis, many homes were foreclosed upon. In fact, the number of homes in foreclosure eventually peaked in the first quarter of 2010 at over two million, based on data from the Mortgage Bankers Association. These foreclosed homes were bought at deep discounts, ranging up to 40 percent and even higher in certain areas by 2009, as the chart above indicates when distressed sales are included. However, once the homes were repaired and later sold again either in the near-term for profit or when the new homeowners decided to move, the sales price was dramatically higher than the original price, owing to those heavy discounts. And as house prices recovered in general, those who waited longer to sell saw even larger increases in their sales price relative to the original purchase price. For instance, over the 12-months ending in April of this year, the inclusion of distressed properties added over two percentage points to overall growth in the price index, but the actual sales price for those troubled homes was likely at or below those of comparable non-distressed homes. So, this is more of a catch up to the race than a grand spree in house prices. For full histories of the FHFA US and 9 Census divisions, click here. According to the MBA, its BAS tracks application volume from mortgage subsidiaries of home builders across the country and participants in the survey collectively account for approximately 20.0% of new home sales based on the Census Bureau estimates. The MBA also notes that since the mortgage application is typically made around the same time that the sales contract is signed, capturing the number of mortgage applications will give an indication of new home sales. 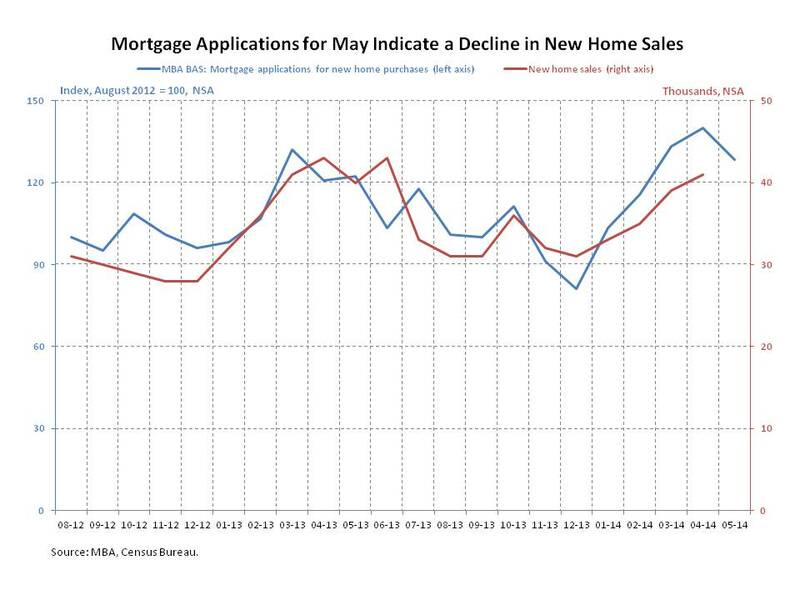 The figure above compares the MBA’s BAS, which tracks changes in mortgage applications for new home purchases, with Census’ not seasonally adjusted new home sales data. According to the figure, the BAS rose by 37.2% between December 2012 and March 2013. Over the same period, not seasonally adjusted new home sales rose by 46.4%. Between March 2013 and December 2013, the BAS fell by 38.4% while new home sales declined by 24.4%. Since December 2013, but excluding May 2014, the BAS rose by 72.3%, corresponding with a 32.3% increase in new home sales. Incorporating the results of the BAS, the MBA estimates a not seasonally adjusted level of 36,000 new home sales and a seasonally adjusted annual rate of 374,000 new home sales in May 2014. This is an interesting project that MBA has taken on, constructing an analogy to NAR’s pending home sales index, for newly constructed single family homes, based on mortgage applications. It’s a relatively new project so the history of the index is short, but it will be interesting to see how the index performs as a predictor over time. Data released by the Mortgage Bankers Association (MBA) indicates that the delinquency rate for mortgage loans on one-to-four-unit residential properties, considered single-family properties, decreased to a not seasonally adjusted rate of 5.69% of all loans outstanding at the end of the first quarter of 2014, 106 basis points below the 6.75% delinquency rate recorded in the first quarter of 2013. This level represents the lowest level since the first quarter of 2008. According to MBA’s National Delinquency Survey, the four-quarter decrease in the delinquency rate reflected a decline across each stage of delinquency. In addition, the foreclosure inventory also fell. As Figure 1 below illustrates, the percentage of all loans past due fell by 106 basis points over the past four quarters. Loans 30-59 days past due fell by 45 basis points, loans 60-89 days past due fell by 15 basis points, and loans 90 or more days past due decreased by 45 basis points. 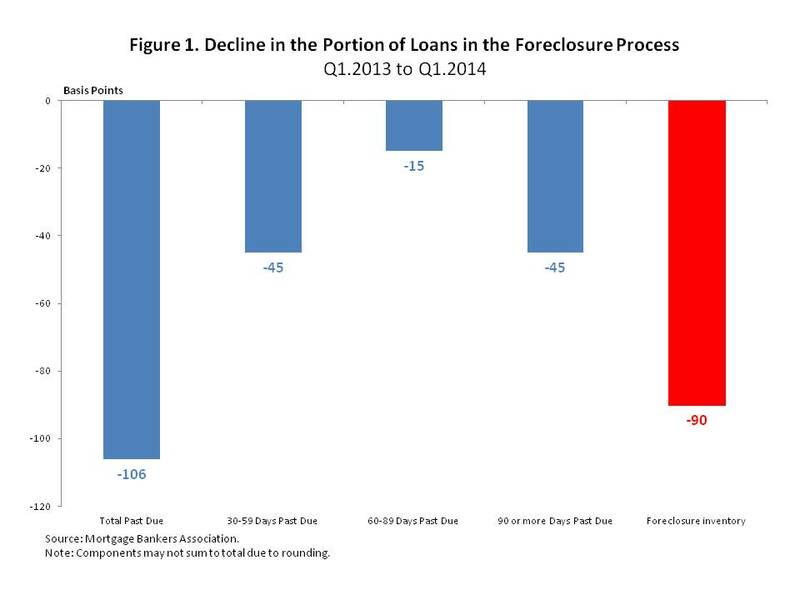 The foreclosure inventory fell by 90 basis points over the past four quarters. In sum, the serious delinquency rate, the portion of loans either 90 or more days late or in the foreclosure inventory decreased by 135 basis points over the past year. The recent four-quarter decline in the portion of loans that are seriously delinquent furthers a trend in place since 2010. Figure 2 compares the share of loans that became seriously delinquent based on their origination year with the annual average serious delinquency rate. According to this illustration, the share of single-family loans considered seriously delinquent peaked in 2010 at 9.0%. Since 2010, the proportion of seriously delinquent mortgages has fallen to 5.8%. The extended decline in the percentage of loans considered seriously delinquent partially reflects a decrease in serious delinquency among loans originated in more recent years. According to the figure below, an average of 4.0% of loans originated in 2005 became seriously delinquent. However, 10.6% of loans originated in 2006, 11.5% of loans originated in 2007, and 6.4% of loans originated in 2008 ultimately became seriously delinquent. In contrast, 1.0% of loans originated in 2009 became seriously delinquent. 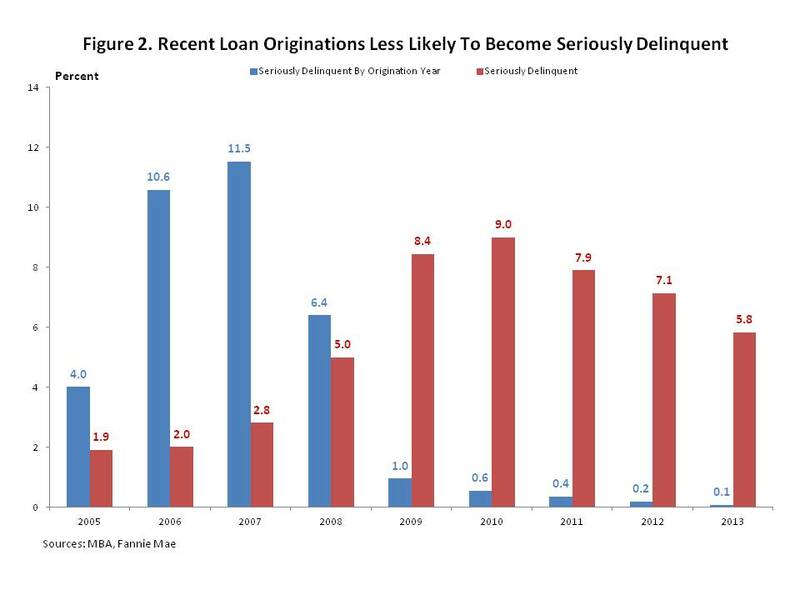 Since 2010, less than 1.0% of originated loans have become seriously delinquent. The Federal Reserve Bank of New York recently reported that aggregate consumer debt, which includes mortgages, rose by 1.1% or $129 billion over the first quarter of 2014. There is now an estimated $11.7 trillion in aggregate consumer debt outstanding. Total consumer indebtedness has now risen for 3 consecutive quarters; however, it still remains 8.1% below its peak of $12.7 trillion that was reached in the third quarter of 2008. Growth in aggregate consumer debt reflected quarterly increases in student loans, mortgages, and auto loans. According to Figure 1, student loans rose the fastest, increasing by 2.9% over the quarter, while both mortgage debt and auto loans outstanding expanded by 1.4%. However, mortgage debt outstanding accounted for the largest portion of the $129 billion increase in aggregate consumer debt, $116 billion, because it represents 70.1% of all consumer debt outstanding. Mortgage debt outstanding has now increased in three consecutive quarters, rising by $324 billion or 4.1% over that period. 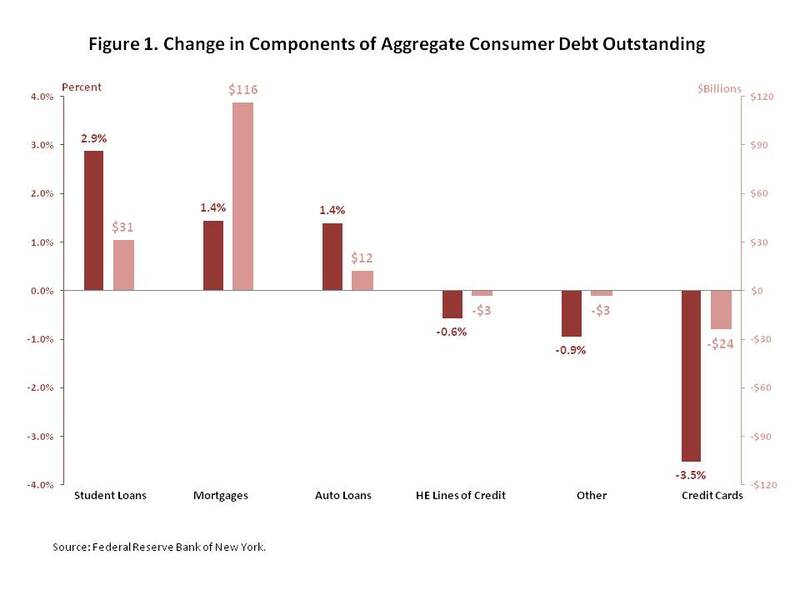 The increases in these three consumer debt categories were partly offset by declines in home equity lines of credit, other consumer debt, and credit card debt, with credit card debt outstanding contracting the most. Other consumer debt includes consumer finance (sales financing, personal loans) and retail (clothing, grocery, department stores, home furnishings, gas, etc) loans. The results of these special questions are shown in Figure 2. 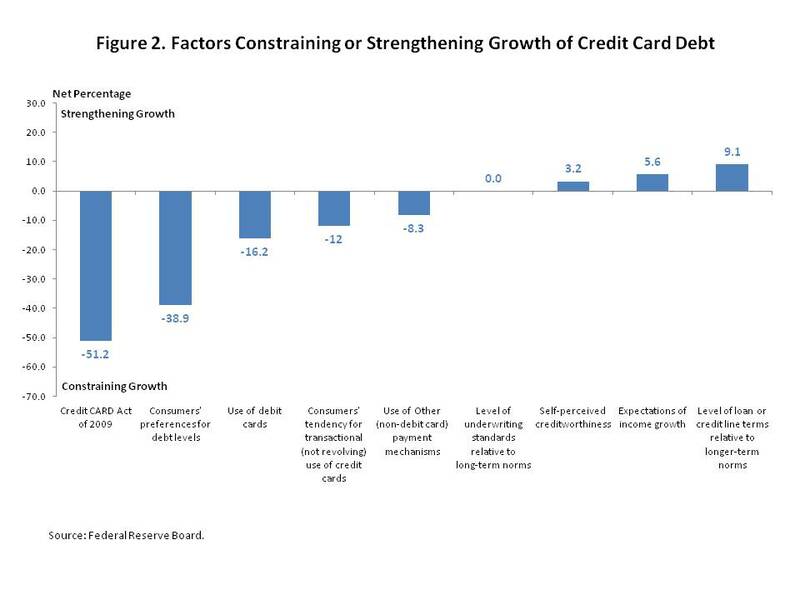 According to the figure, senior loan officers believe that the factors constraining credit card growth include heightened federal government regulation via the Credit CARD Act of 2009, changing preferences for credit card debt, and the prevalence in consumers’ use of substitute payment methods. The Credit CARD Act of 2009 is notable for introducing a series of restrictions on banks’ credit card lending activity. For example, the Credit CARD Act of 2009 required banks to apply credit card payments made by consumers to the debt with the highest interest rate. These restrictions were aimed at strengthening consumer protections, but they also restricted the revenue that banks could collect from credit card accounts. According to the figure, a net fraction of 51.2% of senior loan officers believed that the Credit CARD Act of 2009 was constraining growth in credit card debt outstanding while a net fraction of 38.9% of senior loan officers believed that consumers’ preferences for debt levels were constraining this growth. Consistent with the perception of a weaker preference for debt, a net fraction of senior loan officers also noted that growth of credit cards debt outstanding was constrained by consumers’ use of substitute payment mechanisms such as debit cards and other payment mechanisms, as well as their tendency to use credit cards for transactional use only. What Has Happened to Builders’ Profit Levels? Every couple of years, NAHB Economics asks single-family builders nationwide to provide data from their income statements and balance sheets so that industry-wide benchmarks on profit margins, asset and equity positions can be determined. Results from the recently released Cost of Doing Business Study: 2014 Edition show that margins in 2012 improved over 2008 and 2010, but are still lower than in 2006. Builders reported an average of $13.7 million in revenue for fiscal year 2012, of which $11.3 million (82.6%) was spent on cost of sales (i.e. land costs, direct and indirect construction costs), leaving them with a gross profit margin of 17.4%. Operating expenses (i.e. 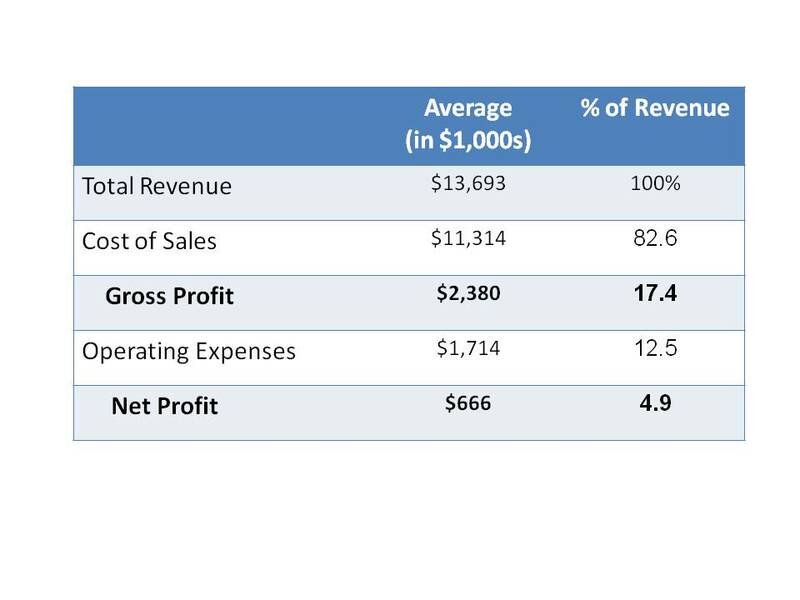 finance, sales, marketing, general, and administrative expenses) took another $1.7 million (12.5%), and so in the end, builders posted an average net profit (before taxes) of $666,000, a 4.9% net profit margin. Builders’ average gross profit margin in 2012 (17.4%) was higher than in 2010 (15.3%) and 2008 (14.4%), but was still lower than in 2006 (20.8%). 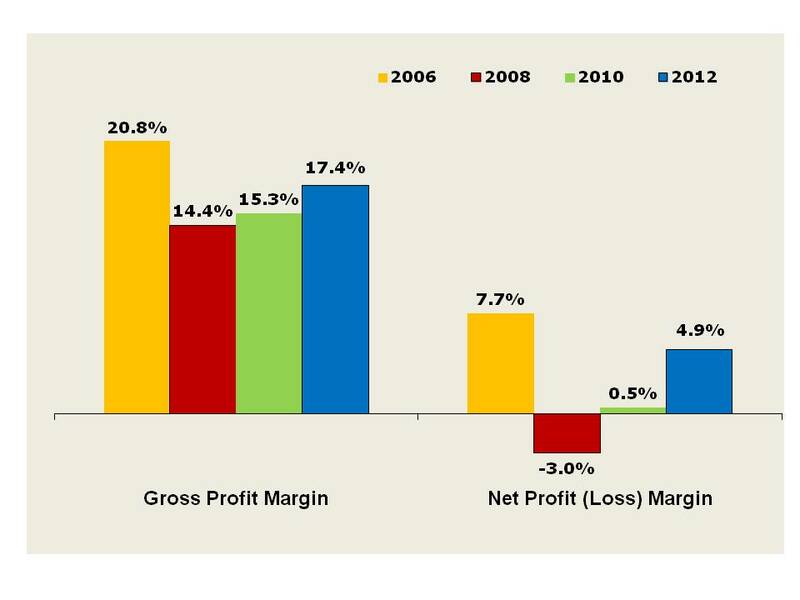 Meanwhile, builders’ average net profit margin jumped to 4.9% in 2012, about 10 times higher than in 2010 (0.5%) and a definite improvement over the loss in 2008 (-3.0%), but still lower than in 2006 (7.7%). As far as their balance sheets, builders reported average 2012 total assets of $8.9 million, $5.7 million in liabilities (63.6% of all assets), and $3.2 million in equity (36.4%). Only 7% of their assets was held in cash, while 67% was held as construction work in progress. 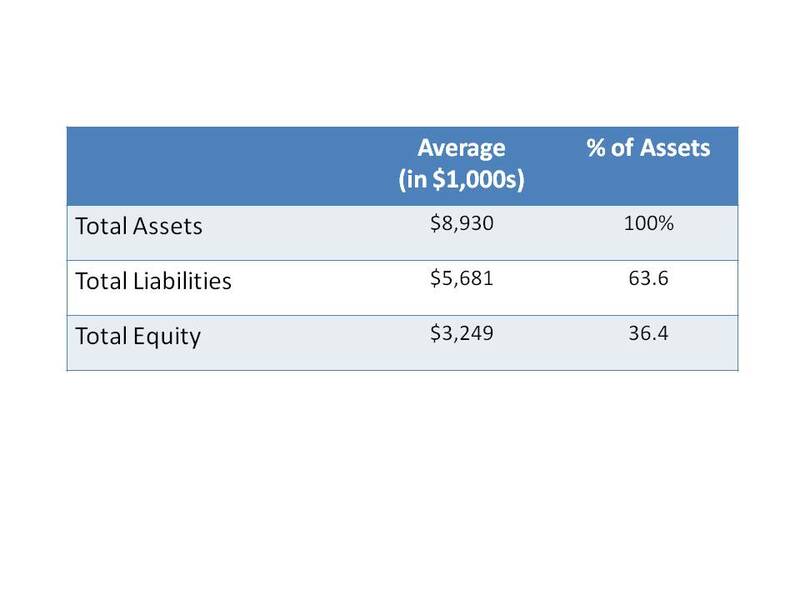 Current liabilities represented about 20% of assets. After being cut in half between 2006 and 2010, builders’ balance sheets saw some improvement in 2012. 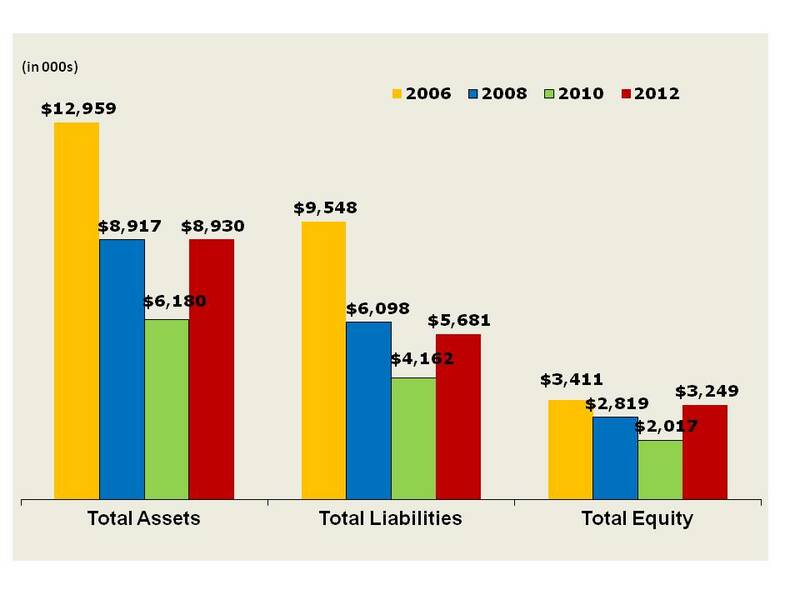 Their average total assets fell from $13.0 million in 2006, to $6.2 million in 2010, but bounced back to $8.9 million in 2012 (same level as 2008). Similarly, average equity recovered to $3.2 million in 2012, higher than in 2008 ($2.8 million) and 2010 ($2.0 million), but not quite where it was in 2006 ($3.4 million). 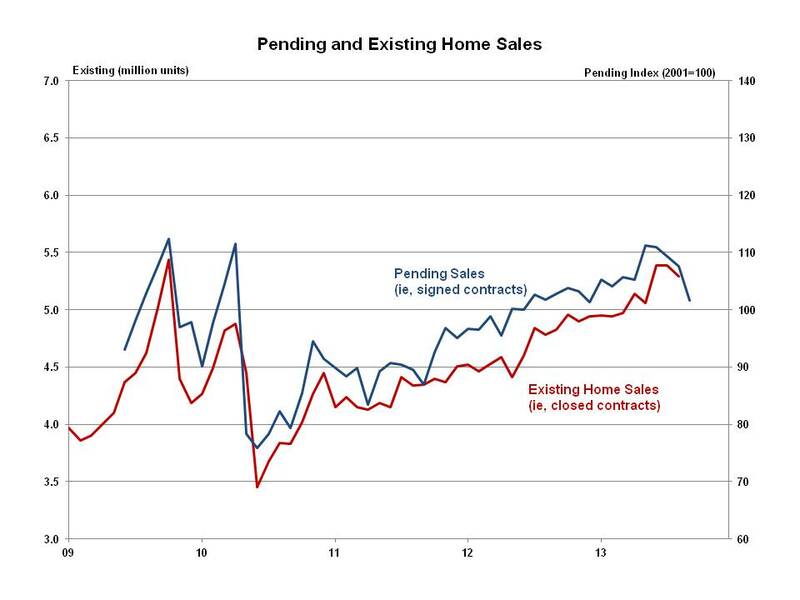 The Pending Home Sales Index (PHSI), a forward-looking indicator based on signed contracts, fell a steep 5.6% in September 2013 to 101.6 from a downwardly revised 107.6 in August. The September 2013 PHSI reported by the National Association of Realtors (NAR) was 1.2% lower than the same period a year ago. The September PHSI decreased sharply in three regions: 9.6% in the Northeast, 8.3% in the Midwest and 9.0% in the West. The September PHSI fell only slightly by 0.4% in the South. Year-over-year, the PHSI fell 6.4% in the Northeast and 9.8% in the West, but increased 5.7% in the Midwest and 2.0% in the South. The PHSI has declined for four consecutive months, and the September PHSI decreased to the lowest level since December 2012. It is worth noting that existing homes sales are reported on a contracts closed basis, so they reflect market conditions with a longer lag than pending sales. These new data suggest a decline in existing home sales for the rest of the year with no upward lift going forward into 2014. The government shutdown took a toll on consumer confidence. That decline could prove to be temporary depending on how the ongoing budget negotiations in Congress play out over the final course of 2013. Over the long run, economic and housing data continue to describe a modest recovery for housing that will lead to higher levels of construction activity in the years ahead. While recent information illustrates that there will be ups and downs along the way, demographic growth and constrained housing inventory will support housing demand going forward.